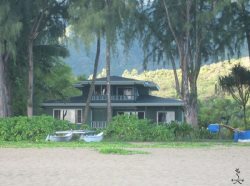 You`ll find a great selection of rental equipment, from snorkels to surfboards, at Hanalei Surf Company. Cute surf clothes and Hanalei logo ware too. Their friendly staff is always on hand to suggest the best beaches for your water-sport excursion. Suzanne Kobayashi`s friend Charlie Cowden started this company back in the early 80`s. It has been around Hanalei the longest of any surf company. They know their stuff. Friendly staff, affordable rentals and an awesome location! Pedal N Paddle is a one-stop rental shop with camping, biking, snorkeling, kayaking and paddle-boarding gear for your next Hanalei adventure. Kayak Kauai has cool set up in Hanalei. They have a little canal that runs from their shop to the Hanalei River so it`s easy to get on the water straight from the shop. They offer guided tours throughout the garden island. In addition, they offer hiking, SUP and camping gear and guides! This surf school is run by Titus and family. He was born and raised here. He grew up surfing Hanalei and where ever the waves were happening. He is famous in the surfing community as an excellent water-man and good musician. His children grew up in the waves are good surfers too.